Every important social issue is impacted by low literacy! When individuals learn how to read, write, do basic math, and use computers, they have the power to lift themselves out of poverty, lower health care costs, find and keep sustainable employment, and ultimately change their lives.” – See more at proliteracy.org. According to a study conducted in late April 2003 by the U.S. Department of Education and the National Institute of Literacy, 32 million adults in the U.S. can’t read. That’s 14 percent of the population. 19 percent of high school graduates cannot read. The current literacy rate isn’t any better than it was 10 years ago (2003-2013 Study). 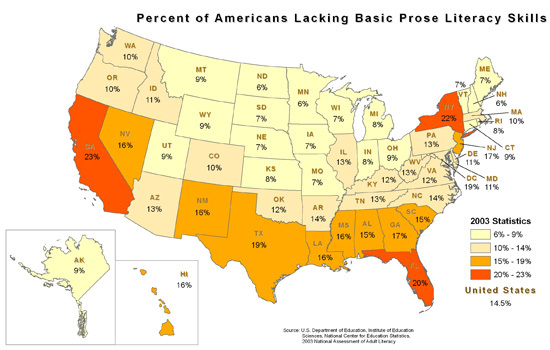 Surprisingly, it’s actually older Americans who most frequently lack adequate reading skills. Approximately one-third of adults who struggle with illiteracy are aged 65 or older. About 50 percent of the 2 million immigrants that come to the U.S. each year lack high school education and proficient English language skills. On a global scale, illiteracy affects 774 million adults aged 15 or older. Women are more likely to develop solid reading skills. The U.S. ranked 16th out of 23 countries in literacy proficiency, 21st in numeracy proficiency, and 14th in problem solving in technology-rich environments, according to the OECD survey. Children of parents with low literacy skills have a 72 percent chance of being at the lowest reading levels themselves. An excess of $230 billion a year in health care costs is linked to low adult literacy. Seventy-five percent of state prison inmates did not complete high school or can be classified as low literate. The infographic below takes a broader interpretation of the material presented above to include numeracy.